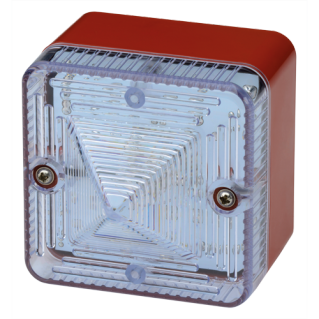 The E2S L101 Series is a compact, robust 5 Joule Xenon/LED strobe beacon ideal for all general signalling applications including fire, security and process control. – 5J xenon strobe or high intensity LED beacon. 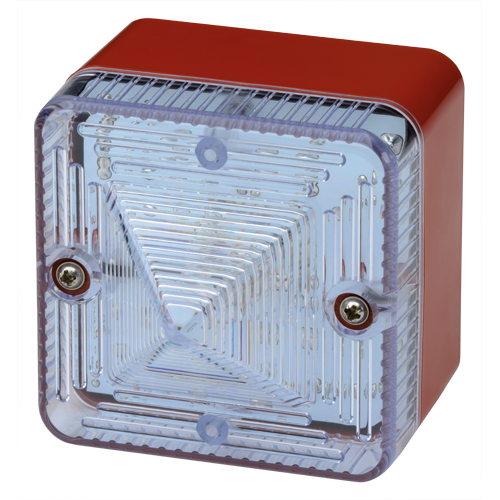 – Can be stacked to provide multi-signal status lights. – Red housing with optional grey or white. – UL approved version available. – Light Intensity: Xenon – 200cd(e); LED – 120cd(e). – Cable Entry: M20 knockouts. ESS70005 L101 5J xenon strobe beacon 60fpm (also 90fpm and double strike flash on DC powered version). 10-14VDC, 500-380mA. ESS7010 L101 5J xenon strobe beacon 60fpm (also 90fpm and double strike flash on DC powered version). 20-28VAC/DC, 250-300mA. ESS7015 L101 5J xenon strobe beacon 60fpm (also 90fpm and double strike flash on DC powered version). 42-54VDC, 175-250mA. ESS7020 L101 5J xenon strobe beacon 60fpm (also 90fpm and double strike flash on DC powered version). 115VAC +/- 10%, 500-380mA. ESS7030 L101 5J xenon strobe beacon 60fpm (also 90fpm and double strike flash on DC powered version). 230VAC +/- 10%, 35mA. ESS7010H L101H LED static or flashing beacons 120fpm. 10-30VDC, 155mA (24VDC). ESS7030H L101H LED static or flashing beacons 120fpm. 90-260VAC/DC, 35mA (230VAC). ESS9001 L101 lens (specify colour).